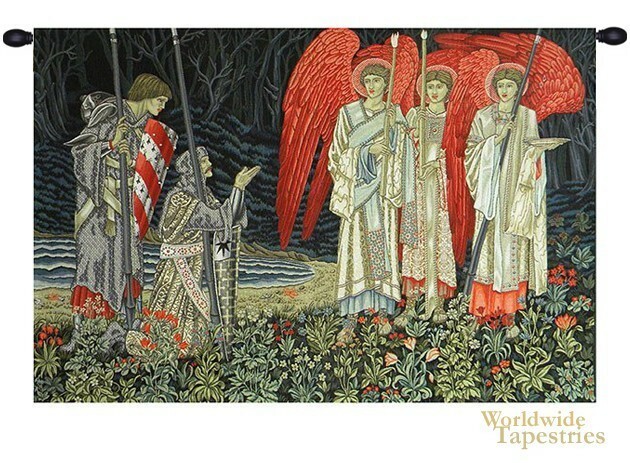 This tapestry is based on one of the 6 panels of the original Holy Grail series of tapestries by William Morris and Co. Here we see a detail from the scene where Sir Bors, and Sir Perceval are with three angels, as Sir Galahad in another scene attains the Holy Grail at the chapel. The original hangs in the Birmingham Museum and was originally woven in 1895-6, commissioned by William Knox D'Arcy. The six panels of the Holy Grail shows the story of the Quest for the Holy Grail, culminating in the scene where Sir Galahad attains it from a chapel in the forest. Here we see the dark forest with its blue grey trees in the background, however contrasted by green and colorful flowers of the forest grounds where the knights and the angels are. This tapestry is backed with lining and a tunnel for easy hanging. Note: tapestry rod and tassels, where pictured, are purchased separately. Dimensions: W 51" x H 38"
Dimensions: W 73" x H 57"